In a survey by expastors.com last year, 71% of ministers said they had gone through spiritual burnout. When I got the invitation to review Fanning the Flame, a book about ministry burnout, I naturally sent it to my pastor son-in-law to review. Here’s Clay Herd’s guest review. 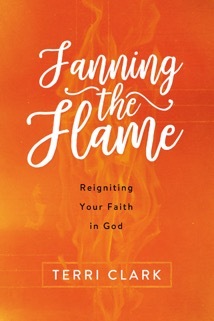 Fanning the Flame is a book about just what it’s subtitle suggests, reigniting your faith in God. Burn out is something that everyone experiences. Ministers, laypeople, we all get burned out from time to time. This book sets out to tackle the stigma that it just comes with the job. In the beginning of the book, author Terri Clark talks about running into missionaries in southeast Asia who were suffering from burnout. Clark challenges daily routines. Sometimes we as Christians can just go day after day reading the same passages of scripture to where it no longer affects us. God’s word should always be inspiring to us. Clark also spends time to challenge her readers to really beef up their prayer life. One phrase I thought of while reading about studying the word of God from this book, was “fast food Christianity”. Where we are in such a rush that we don’t take time to enjoy God, we just shovel Him in as fast as possible. Clark makes a good stand that God’s word is still alive and it is vibrant. We can so quickly be caught up in the trap Satan has laid for us about thinking that being a Christian is boring. Clark helps those that are smoldering Christians take and move their passions back to Christ and help to build that fire back burning brighter than ever. This book is recommended for all Christians, especially those of you that are ministers This book is a must have for your shelf. Disclaimer: I was given a free copy in exchange for an honest review. Opinions expressed are our own.